We don’t spend much money on toys at our house. Books? For sure. Craft supplies? Yes. Things that get our kids outside as much as possible? Definitely. 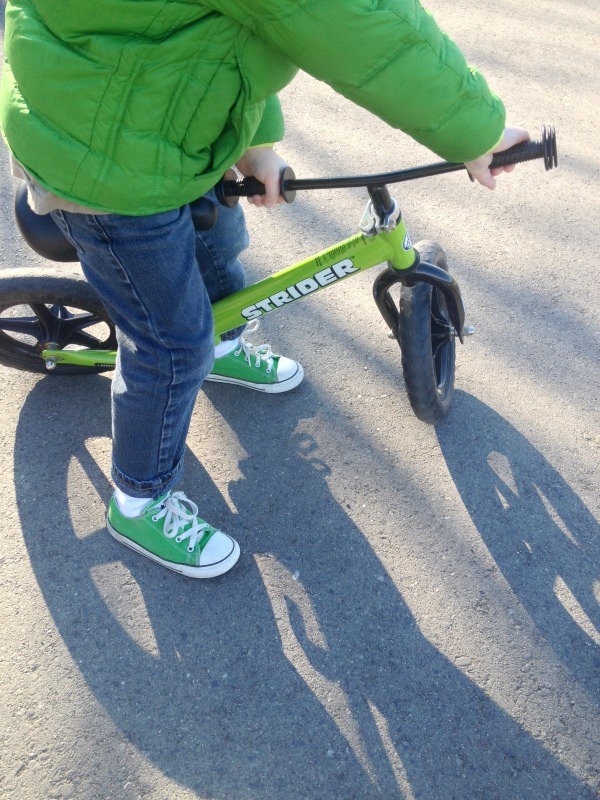 I know you recognize this brand and I’m here to tell you how much we love our Strider Bike. LOVE. All caps. Not only does it get the bellingFAM Approved stamp of approval from Everett, who just upgraded to one of Strider’s XL Seatposts to give his growing legs a little more room to stride, but it’s a favorite for Josh and me, too. We love it when he rides and we can tell that he’ll be ready to jump over to a peddle-bike with confidence, thanks to his time on his Strider Bike. Ev got his Strider for Christmas, just after he turned two and now, at nearly five, he’s still riding it and I suspect he will be for another year… or until his legs get too long, whichever comes first! When he was just a little guy, he totted around on his Strider often, up-and-down the sidewalk in front of our house mostly, getting used to how it feels to balance a bike underneath himself. 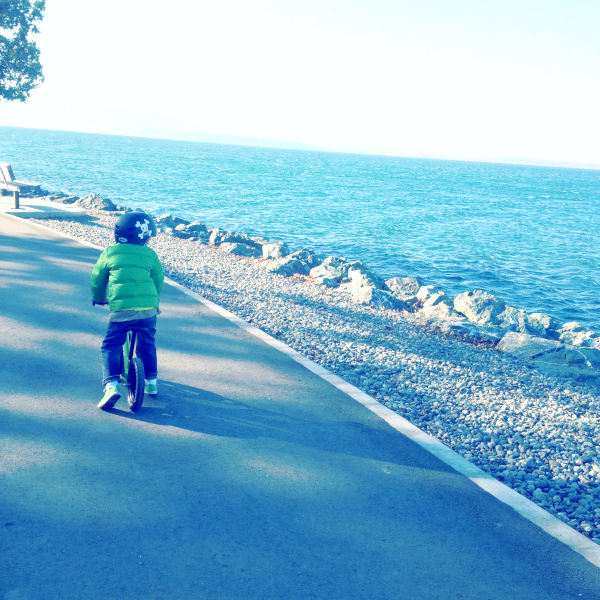 Now, he’s more confident, cruising along much quicker and mastering how to steer and stride at the same time, a skill that often seems to be lost when kids are focusing on trying to peddle a traditional bike. We’re excited to team up with Strider Bikes for a giveaway that’s perfect for kicking off your holiday shopping. Just be sure to let Santa know that you’ve got him covered this year! Want to check out a Strider Bike in Bellingham? Authorized dealers include Earl’s Bike Shop, Lenny’s Bike Shop (Ferndale), Mt. Baker Moto-Sports, Second Shot Sports (Lynden) and Wee Ones Reruns. 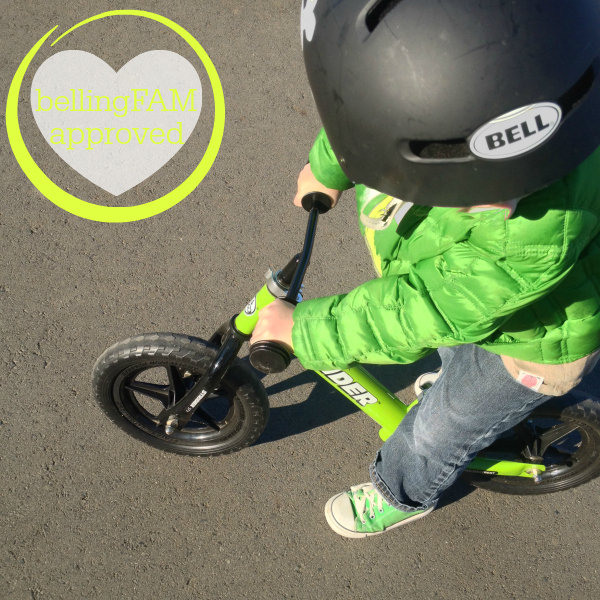 This entry was posted in bellingFAM Approved, Life and tagged 2014, bellingFAM Approved, Giveaways, Strider Bikes on November 14, 2014 by Katie Kavulla. We will take our bike up and down the driveway to the mailbox – that’s 1/2 mile out here! What a fabulous give away!!! Thank you. Awesome giveaway! My little one is only 15 months now but I can imagine her racing around on the trails in Cornwall park in about 6 months! PS where does the time go? Thanks! wow, what a great giveaway! my 3 year old would be thrilled. They are great! Emma has been using hers for almost a year. I bet our little one will be ready to use one in the next year! My sweet baby is 16 months old, but she’s been walking since she was about 10 months old, and running and dancing soon after. I think she would be fearless for something like this! And then she’d want to use it everywhere! My daughter turns 3 in December. She will be riding it at all the beautiful parks we are so lucky to have. Luke LOVES his strider bike. He learned to ride a pedal bike about a month ago- basically taught himself since he was so comfortable balancing on his bike! What a styling kid. Great give away, my 4 yr old would love this! Have heard great things about these bikes! We’ll take it everywhere! My 2.5 year old is so excited about bicycles and would love this! My son is almost 3 next month. I would love to give this to him for his b-day. We would ride it in the neighborhood, down to the park and around the lake! Awesome! This would make a great Christmas gift…and make life a little easier for Santa. My little guy would love this, even though he’s already four, he just can’t seem to figure out pedals. I hope they come in orange! I would love to win this for our daughter. :-) it’s our plan to get her one as soon as her legs are long enough! My little Diego will take his new strider all over the two church parking lots that we live between! Ample space for this little guy to learn and enjoy!! My son would love this!! We go on the Inter-Urban Trail often. I would take my daughter to the park and let her ride with the other kids. We’d take it on a walk through our neighborhood and at the grandparents house! We will take our strider bike for walks around our neighborhood and when we go on vacation! We would take our Strider to the park!